Focus-enhancing note: all in-line hyperlink citations[number] are listed in the References footer of this post. You may procrastinate clicking them until the end for a more in-flow reading experience. Remember when phones were dumb and people were smart? While smart phones become smarter, their push notification interruptions fuel a mobile dopamine addiction that's making us dumber. These devices and their app store interfaces have also trained us to install, organize, and curate ever more mobile "apps" on our home screens. Thanks to designers' obsession over attention, retention, returning eye-balls, and need to compete with all those other apps, they ever more aggressively demand our attention. Their push notifications insist that they're more important than anything else we could possibly be doing. We miss things right in front of us, or we overreact, overmute, and miss important things. Not things. People. Virtual notifications distract us from real people. This is a broader systemic design problem beyond smart phones: Hospitals look to reduce danger of 'alarm fatigue' . Take a moment to recover your focus after skimming or bookmarking those links. Unread count of new messages! Actual new messages from others! Every one of those exclamation points (!) is a dopamine squirt (you probably got a little one even just reading about it happening). Consequence: Person A is distracted by the missed calls, unread counts, new messages beckoning their attention - ooh someone reached out to me! I better check if that's important before I communicate with, who was it I was going to communicate with? Worse yet: the dopamine reinforces this distraction based behavior, turning it into a habit of reacting and losing our context, rather than acting and keeping our flow. What if we focused on people first? What if our mobile devices focused on people first and apps second? Remember when they used to? When you looked up a person first, and decided to txt, call, or email them second? What if we put people first in our mobile interfaces, before choosing an app to interact? 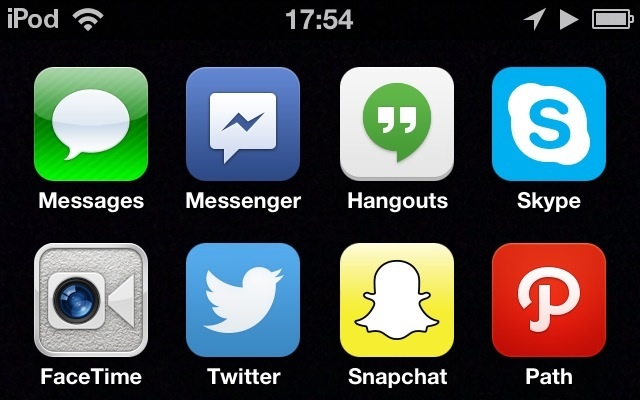 Could we grow a culture of adding icons of each other to our home screens instead of application intermediaries? What if we organized screenfuls of icons of people that matter to us rather than apps that distract us? If we could organize screenfuls of icons of people, what would it look like? An interface with a bunch of faces certainly feels a lot more human. How do we organize screenfuls of icons of people? The above is an actual screenshot. The answer, today, is to go to their personal sites, tap the action icon (or choose add bookmark), and then "Add to Home Screen". Yes, this is why you should make sure your personal site has an icon of you that people can add to their home screen. Don't have a personal site and want one? Go to the Homebrew Website Club Meeting tonight (in SF or PDX) and ask for help setting one up! Or join #indiewebcamp on Freenode and start asking questions! Why would someone want an icon of you on their home screen? In short, human-focused rather than app-focused communication. You want to catch up on someone's site (recent writings, activities) just before meeting up with them in person. You miss someone and are wondering what they're up to. if they happen to have sms: mailto: tel: etc. links on their home page, then their home page becomes the way you can contact them. Your home page becomes your communication protocol. What if you provided icons for each of those yourself as if they were apps, e.g. in a pane on your home page? Like a Contact folder that when tapped would open up a row of icons of the ways you could be contacted, maybe even in your order of preference! Would it be too disruptive to the mobile experience and ecosystem to focus on people rather than apps? How would a person use this? See their personal home page which with methods of contact as a list or icons in the order that they prefer to be contacted. Go across and down that list until you see something you can (and want) to use to communicate, and tap/click it. The browser takes you to a website or "native" app to open the communication channel / new message. Thus after tapping the person you want to communicate with, just one more tap to open a new IM, email, or audio/video call. Note that there was no distraction by unread IM/email or new activity counts beckoning your attention away from your desire to communicate with a specific person. Now their personal site provides more (or possibly fewer!) communication options based on who you are. You're again routed to either a website or "native" app to start communicating. Thus after going to someone's personal site, with one tap you can perhaps SMS Facetime or Skype as well. In an area with poor network reception? In a meeting (or noisy location)? User-friendly privacy: such context-based selection should be seamless enough and yet coarse enough that you cannot necessarily determine from the (un)availability of various methods of communication, what their actual context (asleep, busy, in motion etc.) is. Perhaps this is the solution to the "Can we talk?" problem. Nevermind all this "what should I ..."
Domains (or proxies thereof) work as identity. Just share domain names when you meet, add their icon to your home screen and you're done. Or even share Twitter handles (purely as a quicker-easier-to-say discovery mechanism for domain names), add their icon and you're done. The rest is automatically handled when you tap their icon. How do you make this work on your site? How do you make this work for when someone taps an icon to your site? Conditionally show more (or fewer) hyperlinks based on whitelists, i.e. check their identity against a whitelist or two and then provide e.g. sms:, facetime:, skype: (callto:?) links. Optionally have your site passively (or in response) check your meeting schedule, your Foursquare location, perhaps even native app specific presence (e.g. IM), and cache/show/hide links accordingly. Nobody so far - this is a user experience brainstorm. I couldn't easily find specific references for protocol support in Android Chrome and Firefox for Android browsers. My guess is that the various mobile browsers likely support more communication protocols than the above (and the reference documents) claim. It's probably worth some testing to expand the above lists. Even maps.apple.com/?q= links are supported on iOS (and "geo:" links on Android) as a way to launch the native maps app - perhaps a person could for some identified visitors have a geo/maplink that showed exactly (or roughly) where the person was if and when they chose to. Because the mobile web URL is more robust, platform/device independent, and never mind that the twitter: protocol lacks a way to open messages (or a new message) to a specific person. In addition, I feel I can better depend on DNS to go to twitter.com as intended, whereas it seems like it could be easier for a malevolent native app to hijack "twitter:" URLs by claiming to handle them. Next, it's time to try prototyping this on our personal sites and mobile devices to see if we can make it work and how the interaction feels. If this kind of out-of-the-app-box thinking and personal site focused hackery appeals to you, try it out yourself, and come on by tonight's Homebrew Website Club meeting and show what you got working! Previous posts and notes related to focus (distraction) and specifically to human interface design and processes to improve (reduce) respectively. 2011-07-29 focus tip ... iOS home > Settings > Notifications > click each app, turn off Sounds+Badges. 2012-11-02 Mashable: How is Facebook Addiction Affecting Our Minds? 2013-11-18 WIRED: Can We Talk? 2003-07-06 New York Times: The Lure of Data: Is It Addictive? ^^^^-^^-^^ Note the publication date. Over 10 years ago!